"Berlitz does have its flaws, but is a cheap alternative for beginners." Looking to learn conversational French but would like to avoid paying hundreds of dollars to do it? Then Berlitz French Premier may be the solution that you are looking for. Based on the principles of immersion learning that Berlitz has been teaching for more than 130 years, this is comprehensive language suite, which includes video, software, audio CDs, games and voice recognition. However Berlitz French Premier is not without its flaws. In this review as well as examining some of the advantages of this software, I will also describe its faults. Understanding the programs limitations is important before you choose to buy. 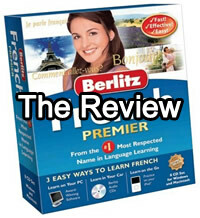 At the end of the review I will give my overall recommendation for Berlitz French Premier. Software Program - This is the main course of Berlitz French Premier. There is both a Mac and Windows version available. 4 Berlitz Audio CDs - You can use these CDs either at home on your stereo or when you are travelling in the car. They are designed to compliment the lessons that you learn in the main software program. iPod Exercises - The iPod or other MP3 player exercises are perfect for learning on the go or while you are doing other activities such as exercising, housework or going for a walk. You can add wordlists to the iPod lessons which help to reinforce words that you had difficulty with in your main lessons. Video Lessons - Listen to native French speakers conduct conversations. Flash Cards - These use Berlitz's own flash card system to help you memorize vocabulary and grammar. Interactive Games - Berlitz comes with a number of interactive games to make your learning more enjoyable. Speech Analysis - With Berlitz French premier you can record your pronunciation and have it analyzed by the software. It will then give you feedback on how it can be improved. The boxed version of Berlitz French Premier costs $39.95. This includes a six month guarantee. If you are unsatisfied with the Berlitz French course you can return it for a full refund during this six month trial period. Instructions on how to do so are included inside of the box. Fun to use - One of the advantages of Berlitz French Premier has over some other courses, is that it is fun to use. Because it doesn't use a strict lesson based format and instead focuses on immersion learning, you can increase your abilities without feeling like you are studying. Some people dislike immersion learning, but if you like to learn by doing, then you will enjoy Berlitz French Premier. Great value for the price - At $39.95 this is a completely different value proposition to much of its competition. To give some examples Rocket French costs $299.95, Fluenz French costs $398.00, and Rosetta French is $374. While these programs do have some features that Berlitz French does not, for the price it is difficult to beat. If you are on a fixed budget the Berlitz French is an excellent choice. Excellent reference tools - The Berlitz French premier contains an excellent array of reference tools. Included among these are word and grammar dictionaries. You can also create word lists for future reference, with a full explanation of each word. Excellent tech support and help - Nova Development, who are the creators of Berlitz French, offer a good level of technical support and help. In addition to the six month guarantee that is offered with Berlitz French Premier, you can also good further help via email, phone or post. Included with the software package is a very thick reference manual which explains in detail the answer to any problem you are likely to encounter. There are also tutorials for each function in the software. Clumsy Interface - Berlitz French Premier doesn't have a great interface. Finding out how to navigate the software requires a process of trial and error, unless you watch through the tutorials first. Once you understand what everything does on the interface, the program is relatively easy to operate, but making more intuitive would be an improvement. Lesson Structure - The program is comprehensive but it could offer clearer structure and sense of progression. One of the things you need to be aware of is that Berlitz is based on the immersion strategy of language learning. For students who prefer a more traditional lesson based format, this may be unappealing. Focused on Beginners - Berlitz French Premier is clearly focused at the beginner to early intermediate language learner. This means that it is well suited for business travelers, tourists and language hobbyists, but is not ideal for advanced and college level students. If you are looking for an immersion based language learning program, at an excellent price then Berlitz French Premier is your best choice. If you follow through the lessons, as they are laid out, then you can go from having no French conversational and reading abilities, through to being able to hold a conversation on a basic level. While this is not the best French language learning product (Fluenz French is superior), at 1/7th the price it is still the leader in the budget market. This product is particularly well suited if you have a trip to France coming up, either for business or pleasure, and you want to arm yourself with workable conversational skills. While some might want a more structured approach, if you like to learn by doing, then you will enjoy Berlitz French Premier. Berlitz has been teaching languages for over 130 years and it shows in the quality of the tuition that is offered in this product, even if the execution suffers from minor flaws. It is also worth keeping in mind, that Berlitz French Premier comes with a full six month no questions asked satisfaction guarantee, so there is no risk to try the program and see if it is a good fit for you. Overall a good product based on proven language learning techniques. Last but not least, you may compare it with other French course programs using the link below.